CINCINNATI (AP) Like his longtime broadcasting cohort used to say, Marty Brennaman is rounding third and heading for home. The Reds play-by-play announcer said Wednesday that he'll retire after the 2019 season, his 46th in Cincinnati. His career started with a chance to call baseball history. It entered a final season with deep sighs and emotional moments. "It's something I've thought about a long time," Brennaman said, calling it one of his most difficult days. "It's something I've anguished over more than anything I've anguished over in my life. I wake up at night, at 4 o'clock in the morning, and I stare off into the darkness and think about what I'm doing." Brennaman, 76, said he wanted to retire while he's healthy and can do things he's always wished. His announcement came one day after Pirates color commentator Steve Blass announced this will be his final season of broadcasting, his 34th with the team. Blass called it "time for me to stop and smell the roses." Brennaman joined the Reds' broadcast team in 1974, replacing the popular Al Michaels. In his second spring training game, Brennaman accidentally referred to the Reds' home field in Tampa, Florida, as Al Michaels Field instead of Al Lopez Field. His first regular-season game at Riverfront Stadium provided a chance to call Hank Aaron's 714th career homer, which tied Babe Ruth's record. Brennaman said color commentator Joe Nuxhall turned to him after the inning and asked his new partner, "What the heck do you do for an encore? I said, `I don't know.'" 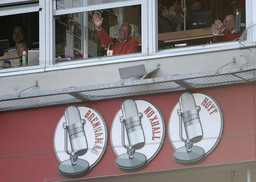 Brennaman and Nuxhall became an endearing broadcast duo for 31 years from 1974-2004. They'd talk about the Big Red Machine's exploits and compare notes on garden tomatoes. Fans referred to them simply as Marty and Joe. "Throughout Reds country, Marty and Joe were a staple of summertime, fans tuning in not just for the love of the Reds but because they loved Marty and Joe," owner Bob Castellini said. Each of them developed a distinctive sign-off line. Nuxhall, a former Reds pitcher, would say he's "rounding third and heading for home," a saying that's remembered in lights outside Great American Ball Park. Brennaman would end each win by declaring that "this one belongs to the Reds." One of the highlights of Brennaman's career was receiving the Ford C. Frick Award in 2000 at the Baseball Hall of Fame, the fourth Reds announcer to receive the broadcasting award along with Red Barber, Al Helfer and Russ Hodges. In addition to his work with Reds radio and television, Brennaman has worked NCAA Tournament games, including 11 Final Fours. His son, Thom, also is a Reds broadcaster. Brennaman has thought about retirement for several years. He talked about retirement with Dodgers broadcaster Vin Scully, who explained that he felt it was time to step away after 67 years in the booth. Brennaman came to the same conclusion about himself in the last few months. He had maintained that whenever he decided to leave, he would simply retire after a season in order to avoid a farewell tour. Others convinced him that it would be beneficial for those who know him to have a chance to honor him. "I'm honored by it, but I'm also going to be very uncomfortable about it," Brennaman said. After wrapping up a question-and-answer session, Brennaman expressed relief. "Is that it? All right," he said, with a deep sigh. "That's one of the toughest days of my life. I've gotten over it now."